Matting agents help control the gloss of the surface on which they are applied. These agents are fine particles that are dispersed in paint and coating formulations in such a way that they scatter the light falling on the surface in a desired, defined manner. This helps achieve matte finish or reduce the gloss of the surface on which they are applied. Silica is a major raw material that is used in the manufacture of matting agents. Precipitated silica and fumed silica are two major types of processed silica that are employed in the manufacture of matting agents. Silica-based matting agents have high efficiency in terms of matting power. Coatings containing silica-based matting agents are recoatable. These agents are employed in all coating systems, except powder coatings. There are primarily two types of silica-based matting agents: untreated silica-based matting agents and wax after-treated silica-based matting agents. Both these types are used in various coating applications. Demand for silica-based matting agents has been rising in wood and industrial coating applications. Based on technology, the global silica-based matting agents market has been segmented into solvent-based, water-based, and others (powder and UV-cured). Water-based silica-based matting agents are eco-friendly and are utilized in paints and coatings applications. These types of silica-based matting agents generate negligible VOC emissions. Therefore, they are referred to as eco-friendly. They have excellent compatibility with water-based resins. The segment is estimated to expand at a rapid pace during the forecast period. In terms of application, the global silica-based matting agents market has been divided into industrial coatings, wood coatings, architectural coatings, automotive coatings, and others (including leather and textiles). The industrial coatings segment can be further sub-segmented into metals, papers, plastics, printing inks, and others (including glass). Industrial coatings is the dominant segment of the global silica-based matting agents market. Growth in wood coatings and architectural coatings segments is estimated to propel the demand for silica-based matting agents during the forecast period. Rise in consumer preference for low gloss and matt finishes in these applications is driving the demand for matting agents. Based on region, the global silica-based matting agents market has been classified into North America, Europe, Asia Pacific, Middle East & Africa, and Latin America. Asia Pacific is the major consumer of matting agents in general and silica-based matting agents in particular. This high demand can be ascribed to the presence of a vast paints & coatings industry in the region. Europe is another key consumer of silica-based matting agents in the world. The silica-based matting agents market in Europe is likely to expand at a sluggish pace during the forecast period. In terms of demand, North America also constitutes important share of the global silica-based matting agents market. The market in the region is anticipated to expand at a moderate pace between 2018 and 2026. The market in Latin America and Middle East & Africa is likely to expand at a considerable pace, creating lucrative opportunities during the forecast period. Expansion in construction and infrastructure activities across the globe is fueling the demand for paints and coatings. This, in turn, is augmenting the demand for silica-based matting agents. The silica-based matting agents market is dominated by large players. It is highly consolidated. Key players operating in the market are Evonik Industries AG, W.R. Grace & Co.-Conn, PPG Industries, Inc., PQ Corporation, The Lubrizol Corporation, Imerys, and Akzo Nobel N.V.
Matting agents help control the gloss of the surface on which they are applied. These agents are fine particles that are dispersed in paint and coating formulations in such a way that they scatter the light falling on the surface in a desired, defined manner. This helps achieve matte finish or reduce the gloss of the surface on which they are applied. Silica is a major raw material used in the manufacture of matting agents. Precipitated silica and fumed silica are two key types of processed silica that are employed in the manufacture of matting agents. Silica-based matting agents have high efficiency in terms of matting power. Coatings containing silica-based matting agents are recoatable. These agents are employed in all coating systems, except powder coatings. There are primarily two types of silica-based matting agents: untreated silica-based matting agents and wax after-treated silica-based matting agents. Both the types are used in various coating applications. Demand for silica-based matting agents has been increasing in wood and industrial coating applications. Based on type, the global silica-based matting agents market has been segmented into precipitated silica, fumed silica, natural silica, silica gel, perlite, and flux-calcined diatomaceous earth. Precipitated silica is the dominant segment of the silica-based matting agents market. The segment is estimated to maintain its dominance during the forecast period. Demand for silica-based matting agents in the natural silica segment is estimated to increase at a rapid pace during the forecast period, as it is natural and environmentally friendly. Based on technology, the global silica-based matting agents market has been divided into solvent-based, water-based, and others (including powder and UV-cured). Water-based silica-based matting agents are eco-friendly and are used in paints & coating applications. They generate negligible VOC emissions. As a result, they are referred to as eco-friendly. Water-based silica-based matting agents possess excellent compatibility with water-based resins. The segment is estimated to expand at a rapid pace during the forecast period. In terms of application, the global silica-based matting agents market can be classified into industrial coatings, wood coatings, architectural coatings, automotive coatings, and others (including leather and textiles). The industrial coatings segment can be further sub-segmented into metal, paper, plastics, printing inks, and others (including glass). Industrial coatings is the dominant segment of the global silica-based matting agents market. Growth in wood coatings and architectural coatings segments is expected to propel the silica-based matting agents market. Consumer preference is shifting toward low gloss and matt finishes in these applications. This, in turn, is driving the demand for matting agents. Based on region, the global silica-based matting agents market has been segregated into North America, Europe, Asia Pacific, Middle East & Africa, and Latin America. Asia Pacific is the major consumer of matting agents in general and silica-based matting agents in particular. This high demand can be ascribed to the presence of a vast paints & coatings industry in the region. Europe is another key consumer of silica-based matting agents in the world. In terms of demand, the market in the region is projected to expand at a sluggish pace during the forecast period. Demand for silica-based matting agents in Latin America and Middle East & Africa is likely to rise at a moderate pace during the forecast period. The report analyzes and forecasts the silica-based matting agents market at the global and regional levels. The market has been projected in terms of volume (kilo tons and tons) and revenue (US$ Mn) from 2018 to 2026. The global market has been represented in kilo tons, while the country-level markets are denoted in tons. The study includes drivers and restraints of the global silica-based matting agents market. It also covers the expected impact of these drivers and restraints on the demand for silica-based matting agents during the forecast period. The report also highlights growth opportunities for the silica-based matting agents market at the global and regional levels. The report comprises a detailed value chain analysis, which provides a comprehensive view of the global silica-based matting agents market. Porter’s Five Forces model for the silica-based matting agents market has also been included to help understand the competition landscape. The study encompasses market attractiveness analysis, wherein type, technology, and application industry segments have been benchmarked based on their market size, growth rate, and general attractiveness. 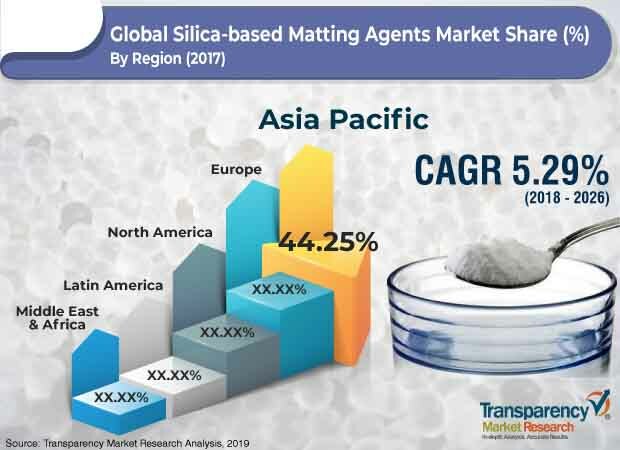 The study provides a decisive view of the global silica-based matting agents market by segmenting it in terms of type, technology, application, and region. These segments have been analyzed based on present and future trends. Regional segmentation includes current and future demand for silica-based matting agents in North America, Europe, Asia Pacific, Latin America, and Middle East & Africa. The report also covers individual type, technology, and application segments of the market in all the regions. The study includes profiles of major companies operating in the global silica-based matting agents market. The global market for silica-based matting agents is dominated by large players. Key players operating in the market are Evonik Industries AG, W.R. Grace & Co.-Conn, PPG Industries, Inc., PQ Corporation, The Lubrizol Corporation, Imerys, and Akzo Nobel N.V. Market players have been profiled in terms of company overview, business strategies, and recent developments. The report provides the estimated market size (in terms of value and volume) of the global silica-based matting agents market for the base year 2017 and forecast from 2018 to 2026. Market numbers have been estimated based on type, technology, application, and region. The market size and forecast for each type, technology, and application segment have been provided for the global and regional markets.